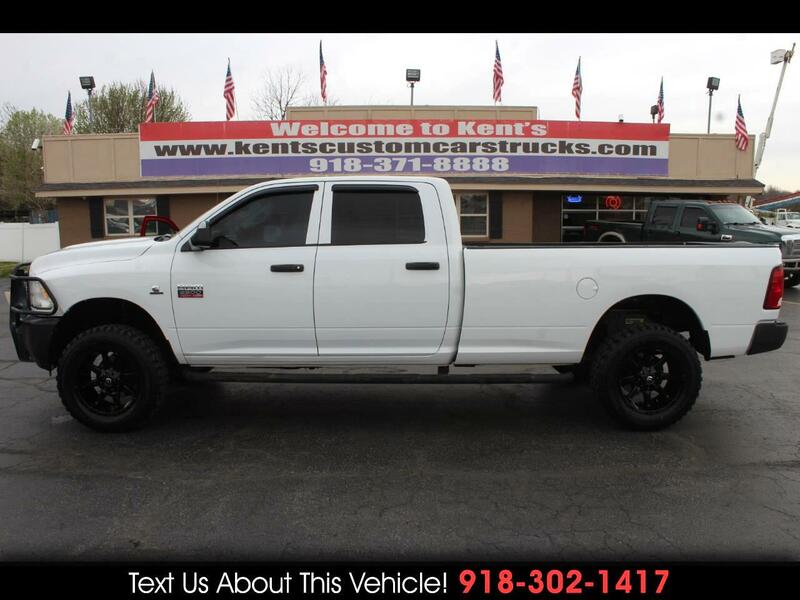 2012 RAM 2500 4x4 ST 4dr Crew Cab 8 ft. Long Bed Pickup, 6.7L L6 Turbo Diesel Engine, 6-Speed Shiftable Automatic Transmission, Cloth Seats, Black Vinyl Floor Covering, ST Quick Order Package 2FA (Includes vehicle with standard equipment, Cummins High Output 6.7L I6 turbo diesel engine rated at 350hp @ 3,000 rpm and 800 ft. lbs. of torque at 1500 rpm, Cummins High Output badge, 5.5 additional gallons of diesel, diesel exhaust brake, current generation engine controller, electronically controlled throttle, 11.50 rear axle, GVW rating of 9600 lbs., front bumper sight shields, tow hooks, 6-speed automatic transmission, and tip start.) Media Center 130 AM/FM Stereo with CD Player, SiriusXM Satellite Radio and AUX Port, AC, Cruise Control, Child Seat Anchors, Power Door Locks and Windows, Power/Heated Exterior Mirrors, Tilt Steering Column, Tinted Windows, Power Steering, Anti-Lock 4-Wheel Disc Brakes, Integrated Trailer Brake Controller, Heavy Duty Shock Absorbers, Transfer Case Skid Plate Shield, 3.73 Axle Ratio, Anti-Spin Differential Rear Axle, Class IV Receiver Hitch, 7 Pin Wiring Harness, Trailer Tow w/4-Pin Connector Wiring, Tow Hooks, New Aplus 35x12.50R20LT Tires, New Fuel 20 inch Alloy Wheels. For more information give us a Call at 918-371-8888 or send us a Text Message at 918-302-1417.